Oatmeal is a constant in my life, but it's usually something I make as quickly as possible. It's so easy to make overnight oats in a jar and or make a pan of baked oatmeal that I pre-portion for the week, then grab it and go. Every now and then, I get the chance to make breakfast on the stove and take my time doing it. 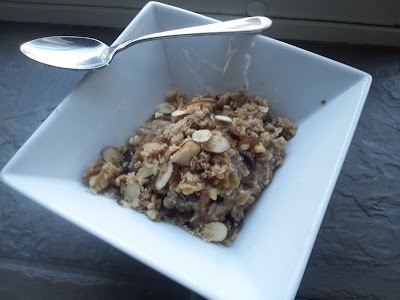 On those days, this is the oatmeal recipe I enjoy making and eating. Bring the water and salt to a boil. Add oats, Splenda raisins, cinnamon and the egg white, stirring to combine. Allow to boil for about five minutes, or until the oats are done to your preferences. The egg white will just melt into the oatmeal, adding protein for staying power. Top the mixture with the nuts and sugar, then serve.